A long time ago (June), noted human John Barrowman gained minor, short-lived, blogosphere fame for saying he wanted to see Jake Gyllenhaal naked. "Just take your clothes off, Jake!" said Barrowman, to some interview person. He also expressed interest in kissing Jake. Earlier this week, Barrowman once again made the blogging circuit afer insisting that Jake play him in a biopic of his life. Should a biopic ever be made. Which is unlikely. 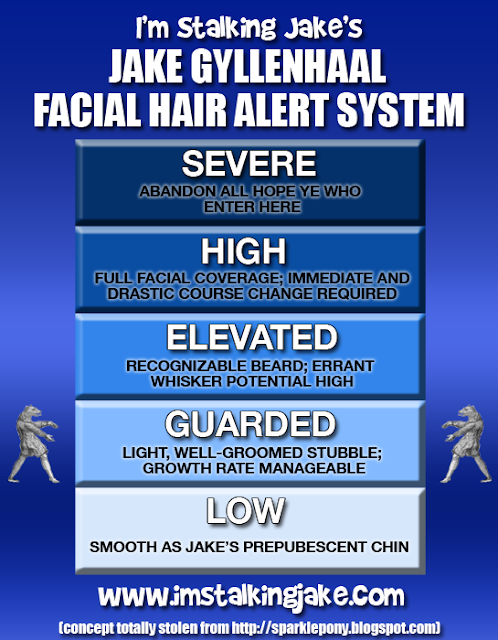 But just in case the opportunity comes up, it should be Jake. Whom I'm sure he still wants to kiss. I think it's really weird that you want to make out with yourself. And to quote a wise woman (me), "If you want to get Jake's attention, I can't think of anything less effective than going the blogging route." John Barrowman has now surpassed Kris Allen as the Worst Celebrity Who Ever Lived. Speaking of Jake (as we often do around here), there are only 39 days left to pre-order your Prince of Persia DVD or Blu-ray! Which is why I have now sold out and put little link-y thingies on the sidebar for your convenience. Death to Barrowman, and enjoy your Friday! Original Barrowman pic from HERE. Thanks to Vanessa for letting me know he was back to his old tricks! *grabs pitchfork and torch* DEATH TO BARROWMAN! The nerve of the man! There are millions, MILLIONS of us who would love to kiss Jake. How dare he attempt to skip the line? You'll get yours one day, Barrowman...That day is near! The story of his life? What is he, twelve now? I think it's rather presumptuous of him to choose Jake Gyllenhaal, like Jake doesn't have a zillion movies in the works. Maybe Zach Braff would be a more appropriate candidate." Now that I read that he wants Jake, possible perpetuating the horrid rumor that Jake is gay, line me up a pitch fork too, PG! I fricking love the T-shirt! Barrowman is totally blacklisted for life. THE NERVE OF HIM. ^^ Dude that cracks me up every time that people think he's wearing it! 39 days till my birthday! 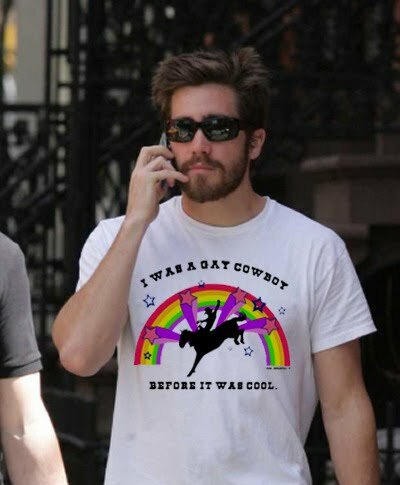 And i STILL wear my Mrs Gyllenhaal shirt to jake movies! Yiew!! p.s. Love the new font on that shirt!!! I feel bad because the old font was so huge, it probably looked like crap! :( The quality of the graphics now are a lot better too. I kind of want to apologize to anyone who bought an old shirt and tell them they're 100% more awesome now!! OK, Barrowman, back the eff up, dude, if you know what's good for ya. (this is so upsetting to me as I am a big fan of his too, damn it) OK, I totally get it dude, I want to snog Jake myself, so I can relate. However, watch yourself, we protect our own & PG already has dibbs on him, so there. On another note, totally love the T-shirts, & I do believe I must have one asap, PG. The ripoffs are so uncool, your design is way better anyway, I love love love the rainbow & all of it. I will wear it proudly to the next Jake movie... heheheh, won't that be confusing to the audience at LAOD??? Hah! Hey, I say Kudos to Barrowman. Speak your mind bro. You can look but you can't touch though. Besides, Jake's property of PG already so...unless you want to be the adulterer. But then again, maybe you do. I desire that shirt greatly. NGL, I thought Jake wore it for real at one point too. Off topic, the state of Jake/movie fandom has really deteriorated lately. I was on an PoP imdb forum trying to defend aspects of the movie (like the fact that Jake is NOT the sole reason the movie to "flopped") and some trolls come on by with vulgarity and name calling. -SIGH-. Decent discussions, where have thou gone?! I know, KD, right? The damn trolls at imdb make me crazy. I can't stop myself going over there to defend our guy & then can not believe what jackasses they truly are. I have vowed to stay away. Besides PoP was not a true flop, regardless of what they all say, $327 mil worldwide is NOT a flop. Unfortunately, the US did not like it so much for some reason, so whatever, it just means we won't get a sequel. OK, so? We know that PoP was a great romp, just what it was supposed to be. OK? OK. That's all. Night all. Plus I keep thinking that imdb forums is a decent and respectable place but keep getting proven wrong. I mean, its one thing to disagree with another, but to personally BLAST someone is crossing a certain line imho. Vanessa - SAME. I always want to try to defend Jake in some aspect, even when something he does or a movie he participates in raises flags. But then the trolling begins and I just give up. I mean, I admit I think some trolls are actually pretty funny here and there, but the majority of them are dimwits who can't even insult properly without using vulgarity. SO SAD THE STATE OF THINGS. That t-shirt is the finest t-shirt there ever was and ever will be. Period. Urgh. I googled John Barrownman and stumbled across this stupid blog. Ur all a bunch of idiotic assholes for taking what he said so seriously. 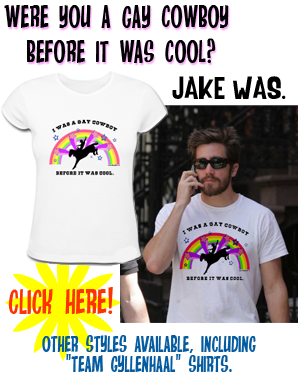 This whole deluded ownership of Jake Gyllenhaal is, in all honesty, pretty damn pathetic. 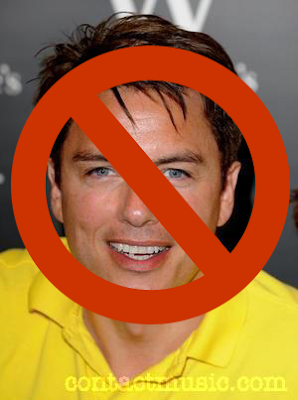 Get a life all you fools, and stop ragging on John Barrowman, who happens to be a legend in his own right. Not only is he a brilliant dramatic actor and singer, he's also one of the leading gay activists in the showbiz industry. But anywais, whatever, this comment is such a waste of time as I'm sure I'll be getting a lot angry retaliations. Oh well. Lets see who has the most violent reaction to this shall we. AND GO! ^^^ This is hilarious. I can't believe you took this post seriously! HA!!! ^^^ Again with the unnecessary hostility! :) I think you'll find that actually every single person who reads this blog agrees *completely* with what you've said. 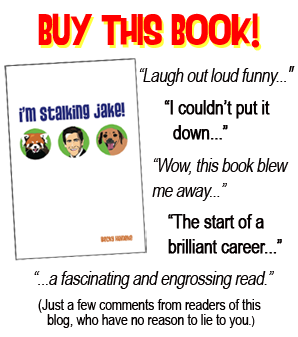 This blog exists to promote a book that I wrote about another Jake blog, which I was a part of back in 2006/2007. Entries such as this one are written in the vein of the original blog, which (more so than anything) made fun of people's slavish devotion to any one single celebrity. everyone who commented hate about barrowman need to calm down. seriously, he was joking...some people have been known to do that occasionally. ^^^ Excuse me, anon, but we all knew here that what Barrowman said & did was all in jest. That is the spirit of this blog anyway, for fun & joking around, none of what was said about him was serious. I personally love John & always have. & FYI, Jake has made a lot more than 6 movies, he starred in 15 & had smaller parts in a few others, & has done stage as well. Not to mention, he has also won a BAFTA & been nominated for an Oscar & GG & won numerous other film awards. You really ought to read some of the comments before commenting yourself, because if you had, you would have already seen that this was just sarcastic humor & not serious at all. Cheers. ^^^^as i said, i didnt look up JG before commenting so i have no idea what/ how many films he hsa been in. thank you for informing me. i am so sorry that i didnt understand that you were all being sarcastic...im not retardd, sorry. EFF YOU ALL. JOHN BARROWMAN IS GOD. AND JAKE IS HIS PET. SO LEAVE THEM BE. Apparently you have missed the fact that Barrowman has had 2 best selling autobiographies and is one of the finest singers and actors on either side of the ocean. More importantly, you missed the humor of his comment since he is married to his long time partner! So don't worry homophobics JB won't be stealing any man away from you, he has the one he loves. I've honestly never read such trash talking on a blog before and will be glad to wash my hands of these absurd comments about an actor you obviously know nothing about! I admire Jake as well but don't trash another human in order to make the other look good. It backfires. Okay, first I wanna say that I understand that this article was meant to be sarcastic. I'm not sure if John actually said those things, (and if he did, well...I forgive him.) But this article was far from funny. Especially when you wrote "Death to Barrowman". How dare you write something so horrible. I don't care if it was a joke, you don't f**king joke about death. It doesn't matter WHO it is! I don't like Justin Bieber: I think he undermines celebrities who actually WORK to earn their fame. I would NEVER say, "death to Bieber." I'm not sure who this "Jake" guy is, but I know John Barrowman. John is and extremely talented, charming and outspoken man. He's worked hard to get where he is today, and only asks for respect in return. If he DID say those things, I'm sure he'd be embarrassed of what he said. He's not a rude person, he's very mature. Show him at least a LITTLE respect. any plugin or anything you can advise? I get so much lately it's driving me mad so any assistance is very much appreciated. reporting! Keep up the excellent works guys I've added you guys to my blogroll. Heya i'm for the primary time here. I found this board and I to find It truly helpful & it helped me out a lot. I hope to give something back and help others such as you aided me. Either way stay up the excellent quality writing, it is uncommon to look a nice blog like this one today. of the issues. It was definitely informative. Your site is extremely helpful. as this this web site conations genuinely pleasant funny data too. What's up friends, how is the whole thing, and what you wish for to say regarding this piece of writing, in my view its actually remarkable in favor of me. After exploring a few of the blog articles on your site, I seriously like your technique of writing a blog. It's truly very difficult in this active life to listen news on Television, thus I just use web for that purpose, and take the most up-to-date news. on the web I found this site as a most excellent website for latest updates. I'm more than happy to discover this website. I wanted to thank you for ones time for this particularly fantastic read!! I definitely liked every little bit of it and I have you bookmarked to check out new information in your site. your website, I seriously appreciate your technique of blogging. You are so stupid. Barrowman is a man with class. His sense of humor is over you lack of perception. You must be a kid or something...I don't know. Maybe you just don't have ability of thinking. But this is what I still can forgive, stupid person is not that rare phenomenon. But..you wrote "Death to..." and this is HATE. This is disgusting and makes me sick, no matter it's about Barrowman or some other...Go to doctor. Or to school...you sarcasm is very poor. These all praised post anonymous...are yours,I guess. http://www.oikoservice.it/ http://www.i-espanasexowebcams.eu/Nike-Free-Run-3.html http://www.benameur.nl/goedkoop-nike-free-run.html http://www.apkservicejan.nl/nike-free-run.html http://tonelliperfare.it/ Artificial plants. [url=http://www.apkservicejan.nl/nike-free-run.html]goedkoop nike free run[/url] [url=http://www.i-espanasexowebcams.eu/Nike-Free-Run-3.html]Nike Free Run 3[/url] [url=http://tonelliperfare.it/]hogan interactive[/url] [url=http://www.e-g-g.it/]hogan outlet 2014[/url] [url=http://www.i-espanasexocamera.eu/nike-free-5.0.html]nike free 5.0[/url] It should only feel good. Intake water is also necessary. nike free Nike Free run 5.0 hogan interactive outlet nike free run hogan interactive As he is believed to wear leather shoes.